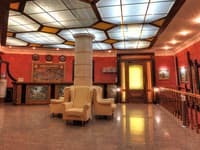 One-bedroom apartment is located in the historical center of Kiev. The nearest metro stations are “Teatralna” and “Khreschatyk”. Near the apartment are the main attractions of the capital: the National Opera of Ukraine, Independence Square, Golden Gate. There are plenty of restaurants, bars and shops. 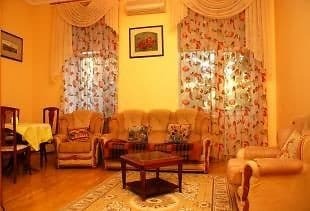 Comfortable apartments with modern design, good quality repairs and furnishings. In the case of long stay, apartment cleaning is done every 4 days free with the change of bedding and towels. The daily cleaning is possible for an additional fee if necessary. 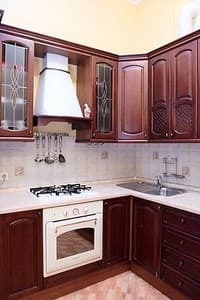 The services offered are the purchase and delivery of food in the apartment. Free Wi-Fi available. You can order a transfer to / from the airport and train station. Distance from the train station is 2.7 km from “Boryspil International Airport” – 34,9 km. 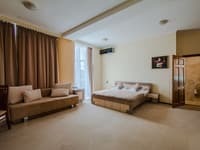 Description of the room: Business class apartment with a large double bed, sofa, kitchen, large living room, jacuzzi and all necessary equipment. The area of ​​the apartment is 56 sq. M.
Description of the room: The beautiful location of the house, at the intersection of Pushkinskaya and Prorizna streets, on the opposite side of the house is a small cozy square with many cafes and restaurants, 200 meters from Teatralnaya and Golden Gate metro stations, 100 meters from Khreshchatyk metro station, 300 meters from Independence Square. Description of the room: Luxury apartments with a bedroom, a living room, a kitchen and a bathroom with a jacuzzi. There is a large double bed and a sofa bed. The area of ​​the apartment is 60 sq. M.
Extra beds are available upon prior approval. Children can stay in the apartment. 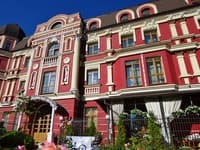 One-bedroom apartment is located in the historical center of Kiev. The nearest metro stations are “Teatralna” and “Khreschatyk”. Distance from the train station is 2.7 km from “Boryspil International Airport” – 34,9 km.